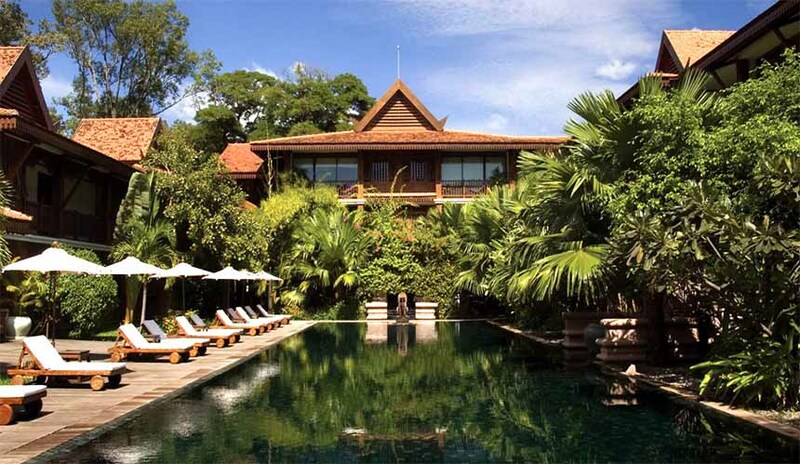 Below are only brief descriptions of the finer luxury hotels in Cambodia, some long-time favorites featuring fabulous service and scenic settings, with iconic French-colonial properties, such as the Raffles Grand d'Angkor, to traditional Khmer design offerings, such as La Residence d'Angkor, as well as interesting new places like the Phum Baitang that are introducing traditional aesthetic in a luxury package. 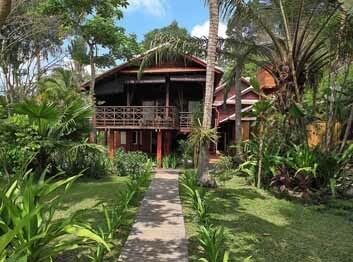 Make no mistake, the handful of top properties in Siem Reap are as different a can be. Siem Reap also offers private villas with spacious outdoor spaces — let us recommend the perfect place. If you are also visiting Phnom Penh, consider continuing further south for a break on Song Saa private island. 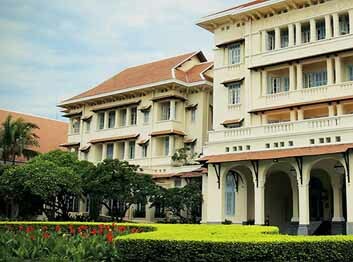 La Residence d'Angkor was a longtime favorite fromerly of the Pansea group of hotels (including the Governor's Resdience in Yangon and Phuo Vao in Luang Prabang). Belmond (formerly Orient Express) has continued the quality and authenticity that made La Residence Siem Reap's most charming and pleasant property, and like many of there other hotels, featuring an ideal location on the Wat Bo side of the river within a block or two of the town's main attractions, including the night market. Dark teak wood runs throughout and is furnished in the local style, the addition of modern comforts and luxurious touches create a welcoming but understated atmosphere. The hotel has fifty four spacious king-bedded or twin rooms and eight newly renovated suites rooms. All have luxurious spacious bathrooms with with generous free-form baths. All rooms also offer individually-controlled air conditioning, IDD telephone and free wireless Internet connectivity available in all guest rooms. 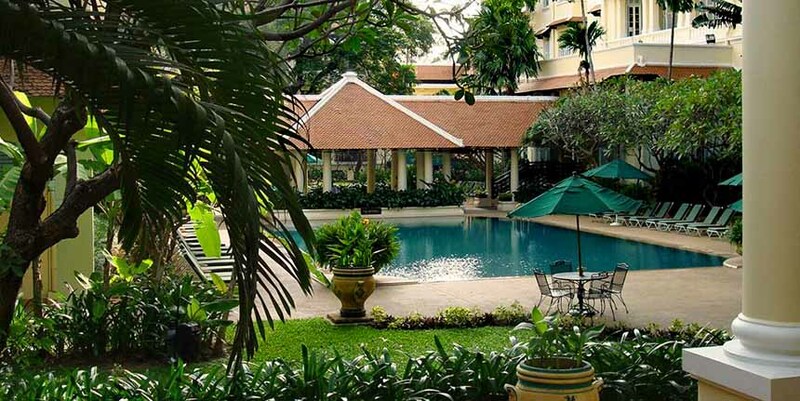 The hotel complies with World Bank environmental standards and has a policy to protect the environment and promote sustainable development in Cambodia. Our top choice for authentic style perfectly matched with luxury, top service, and dining, with an unbeatable location with most attractions only a short stroll away. A one-of-a-kind small indoor pool within the low lighting of the spa provides a tranquil place to take a dip and and afternoon siesta. The newly renovated suites have finally elimnated the massive terrazo tubs which were a challenge to step into, for modern walk-in showers. Suites can be reorganized to have a single patio. Choose deluxe pool rooms for quiet. For families, there two connecting deluxe rooms, but these areon the river which can be noisier. 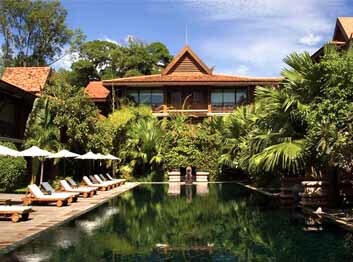 Amansara is situated on the main road leading into Angkor, four miles distant. 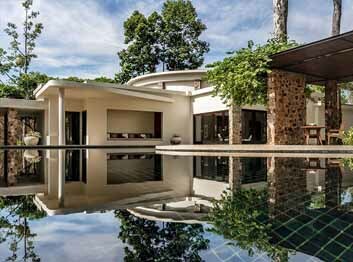 A stark, modern concrete Deco villa once a guest residence to Cambodia King Sihanouk that captures the 1960's era when it was built. The central focus of the property is the small swimming pool, lined with and lounges, and moderately-sized dining room. Siem Reap''s many attractions and fine restaurants lie only a few block's stroll or tuk-tuk ride away. In Siem Reap, we recommend Aman junkies consider withdrawal. The Amansara is arguably the least interesting, comfortable, and poorest value of all the Amans. Service is still top-notch, but Amansara's suite rooms are the smallest in Siem Reap (a mere 650 square feet), and lacking in public spaces to make up for it. For families, kids will find little joy in the small suite plunge pools or moderate shared pool (where Aman's typical clients tend to be less admiring of kids at play). More importantly, the property sits on what is now a busy main road into Angkor and the din of traffic wafts over the property all hours of the day. 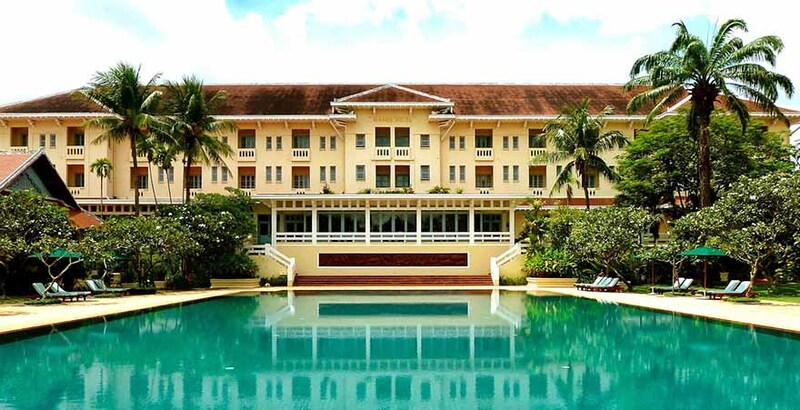 Consider the nearby Raffles, an elegant and massive, property with plenty of quieter green and public space, as well as the largest pool in Siem Reap. Arguably, but in our opinion, Indochina's finest luxury hotel. Located on a quiet street on Phnom Penh's embassy row, the Raffles is Cambodia's most luxurious hotel and in our opinion, is the only colonial period hotel that captures all the details just about right (with Hanoi's Metropole a distant 2nd). Unparalleled service marks a stay here along with a pleasant and verdant central pool area, the perfect place to relax with a book. Breakfast is served on an outdoor veranda to enjoy the warm mornings the capital typically has. A short walk away is Wat Phnom, where legend has it the city was first founded. The 800 year-old "Mountain Pagoda" situated on a rise in the large park, a popular gathering place for locals and prime spot for people watching. Dining and bar choices include the Restaurant Le Royal, Writer's Bar and the Elephant Bar. The Raffle's spa includes a fully equipped gym, steam and sauna, as well as a menu of treatments. One of those hotels that will challenge your sightseeing schedule, for it feels like nothing can compare to leisurely breakfast on the veranda, lazing in the lush pool area, or enjoying a drink in the Elephant Bar. The Raffles offers the finest service of any hotel in Indochina, with every aspect of the property well thought out and impeccable maintained. 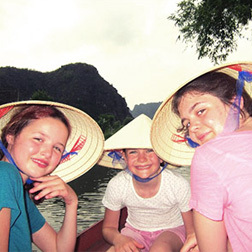 If privacy is paramount, Indochina Travel can arrange two private, full-service luxury villas in the heart of the city set within a private compound with lush gardens and a private pool. The villas are 318 m2 with a master and guest bedroom and large outdoor terraces. 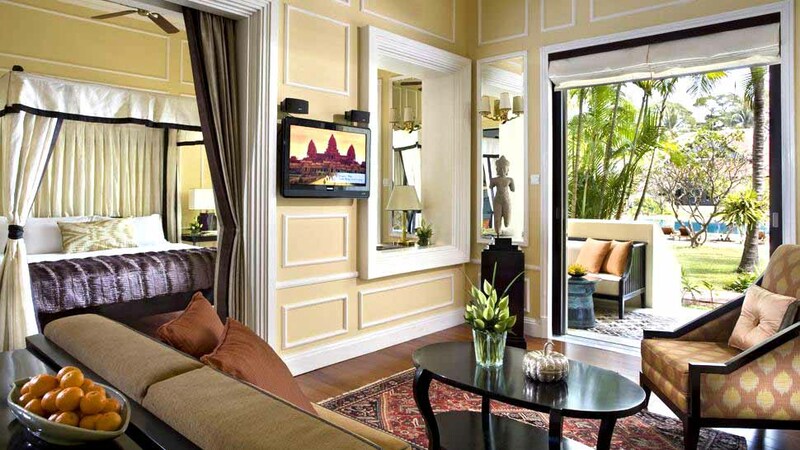 The villas also enjoy full access to the Raffles Grand d'Angkor Hotel facilities and restaurants. Each villa has one master bedroom with a king-size four-poster bed, one bedroom with two twin beds and a spacious living room with dining area. Beautifully decorated with original Angkorian artifacts, antique furniture, Persian-style carpets and wooden floors. The two en-suite bathrooms both have an original claw-footed bathtub and separate shower unit; a third bathroom is available in the living area. Each villa has full pantry facilities with a private wine cellar, and 24 hours personal butler service to accommodate all your needs. Home to many rich and famous, this luxurious accommodation is exclusive and private. Ideal for families or guests celebrating special occasions, a stay in this exclusive villa will ensure them lasting memory of a lifetime. Max 6 persons with 2 roll-aways (charge applies). Set within a private, jungle compound within Siem Reap is this remarkable restored traditional Khmer home. The rustic teak villa is not for everyone, but provides an ultra-private experience in a sprawling compound as spacious as the entire Amansara, but having only two buildings, one the private villa below and the other three-room wooden home. The property features a large pool for afternoon breaks. Our favorite family property in Siem Reap. With only four rooms served by eight staff, the large property is virtually yours alone. A remarkable setting within lush tropical trees and foliage, yet right within Siem Reap, only blocks away from all the sights, attractions, and dining. 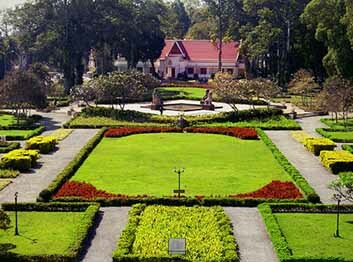 The Raffles Grand d'Angkor sits prominently at the main crossroads of town within the surrounding of a fifteen-acre French gardens. Stylish and beautifully restored, all 131 accommodations feature country-style furnishings and deluxe baths. The Landmark rooms and Personality Suites are richly decorated with pieces of the French colonial period. 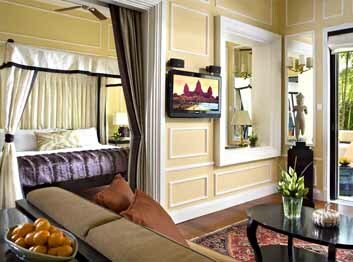 The four specially created Personality Suites took their direction from people who have been closely associated with Angkor. Named after well-known luminaries Henri Mouhot, John Thomson, Louis Delaporte and Henri Marchal, these suites are located in the center of the main heritage building. Each suite is fitted with a claw-foot bathtub and separate shower; and a relaxing day bed on the balcony overlooking our magnificent pool, which was modeled after the Angkorian Royal bathing pond. Personality Suites size: 48sqm, max 2 persons. Six Colonial Suites have been converted from Studio Suites in 2011, offering the discerning travelers a new choice of accommodation. Each equipped with walk in wardrobe, separate sitting area and vintage furnishing, the bathroom features separate shower and bathtub. Beautiful French doors lead to the spacious balcony with views of our French garden. Colonial Suite has both King suitable for couples, and Twin beds suitable for family or friends traveling together who would appreciate the finer accommodation. (Size: 48sqm) Max 3 persons with one roll-away (charge applies). Dining options include Restaurant Le Grand, serving traditional Khmer cuisine. Recreational amenities include a 115-foot outdoor swimming pool, tennis courts and a health and fitness spa. This is the appropriate choice for those seeking a grander, more traditional full-service hotel. For a more intimate experience, consider the smaller La Residence which is built of wood and furnished in the local architectural style, the addition of modern comforts and luxurious touches create a welcoming but understated atmosphere. 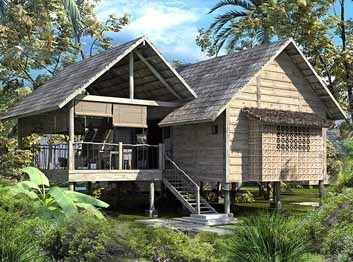 A top three choice to consider, especially the semi-private bungalows which are more spacious than the Amansara. 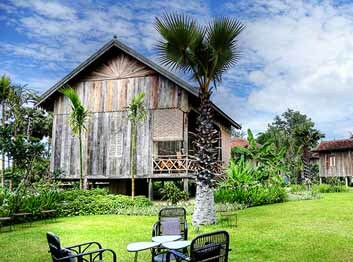 An elegant hideaway is set within eight acres of lush gardens and paddy fields. The architectural design has been inspired by traditional Cambodian wooden housing, comprising forty-five spacious villas, twenty-five with private terrace and twenty with private plunge pool. The wooden and stilted villas and interiors are reflect traditional Cambodian design, offering guests a unique experience in Siem Reap. A luxurious and tranquil Spa Temple offers seven treatment rooms, a sauna, steam room and relaxation area. A yoga pavilion, fully-equipped fitness room and 50m outdoor infinity pool complete the resort's leisure facilities. During the day, guests can enjoy a light meal or sample a refreshing homemade juice at the Pool Bar. For elegant dining, Phum Baitang's two restaurants, one locally-inspired and the other offering international cuisine, serve delicious meals using fresh organic herbs and vegetables from the resort's own gardens. At the Cigar/Cocktail Lounge, guests can sip a cocktail while watching the sun set over lush paddy fields. The most exciting addition to the Siem Reap hotel scene in awhile, due to open 1 August and so appears to be on schedule. 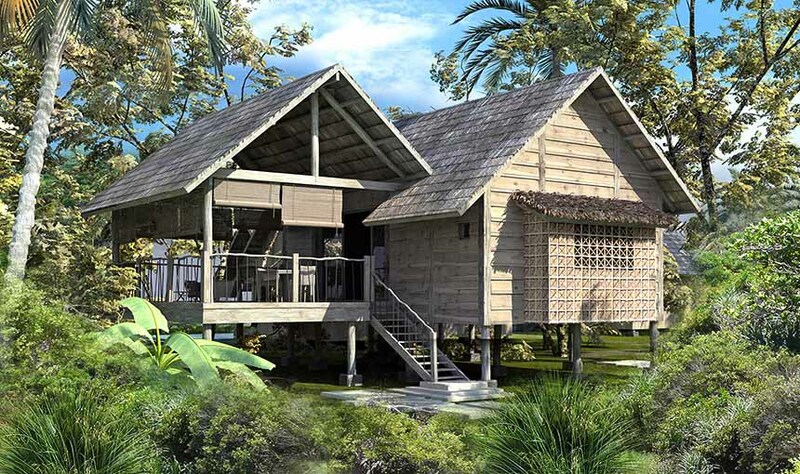 Called Phum Baitang (Green Village), so far it looks fantastic, very much the same style as the Six Senses hotels. 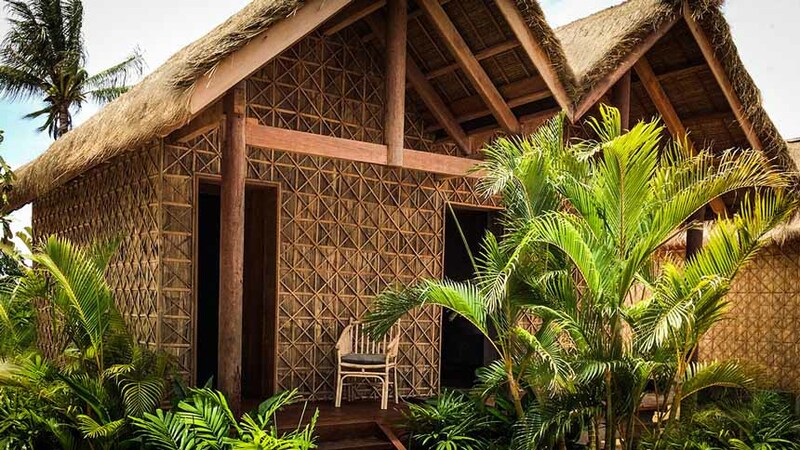 Designed by the same team responsible for the renowned Nam Hai and Six Senses Con Dao. We think of it like a 5 Star+ version of authentic, local style Sala Lodges. The rates are very good, much lower than Song Saa and Amansara but a bit higher than Le Residence and Raffles. Please contact is for a fact sheet and to view our Dropbox images. An authentic "sala" or traditional house lodging experience within a group of eleven actual buildings that have been transported from around the region and restored in a tranquil setting about ten minutes from downtown. 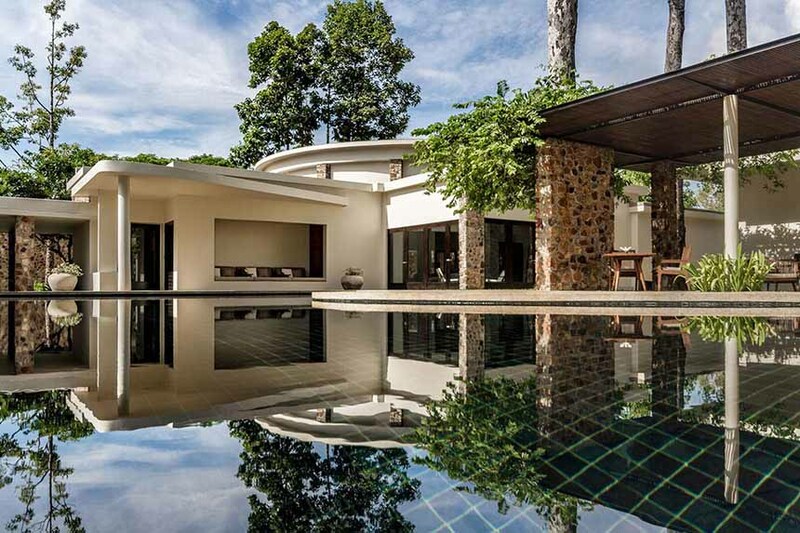 Each house, with its own distinctive history and architecture affords Sala Lodges its quality as one of the most unique and intimate properties in Indochina. Voted a Best New Hotel in the World for 2014 by Travel & Leisure. Sala Lodges are beautiful, meticulously maintained with excellent service and garnering consistently good feedback. The owners are Belgian and are very pro-active, easy to work with and service orientated. They offer a unique genuine Khmer traditional village home stay in actual salays which have all been moved in from different provinces and painstakingly re-assembled amidst the lush gardens. Walkways lined by miniature rice paddies weave through the gardens and connect the houses. Although they look rustic and authentic from the outside, inside the lodges have been beautifully renovated. Think of it almost like a Six Senses style-rustic, barefoot luxury, although not of the Six Sense's caliber. All spacious lodges are all decked out with large, high quality king sized beds and very well finished. The bathrooms are especially cozy and all are fully air conditioned. A nice two-bedroom house works perfectly for families. There's a lovely infinity pool set in the gardens, a very peaceful setting. A bistro style restaurant, offers delicious Khmer and international fare yet it is only about 10 minutes by tuk tuk from downtown dining and shopping. It is one of my favorite hotels in Southeast Asia, not just Cambodia and I cannot recommend it highly enough. Note: the lodges are not for travelers accustomed to the Metropole or La Residence luxury properties who may find the the property a bit too authentic. We would rate it as a very good 4-star boutique and something very original and different, which is reflected in the price - more expensive than HanumanAlaya Boutique, but less than La Residence and Raffles. Cambodia's first world-class beach resort, Song Saa ("The sweethearts"), has opened off the southern coast from the coastal city of Sihanoukville (thirty minutes from the airport, then another forty-five minutes by boat-or an interesting three-hour drive from Phnom Penh). The Song Saa, along with the Nam Hai and Amanoi, now offers three properties to compliment travel in Vietnam and Cambodia, rather than the longer trip down to the Thai islands. This resort offers a setting similar to Maldives properties. 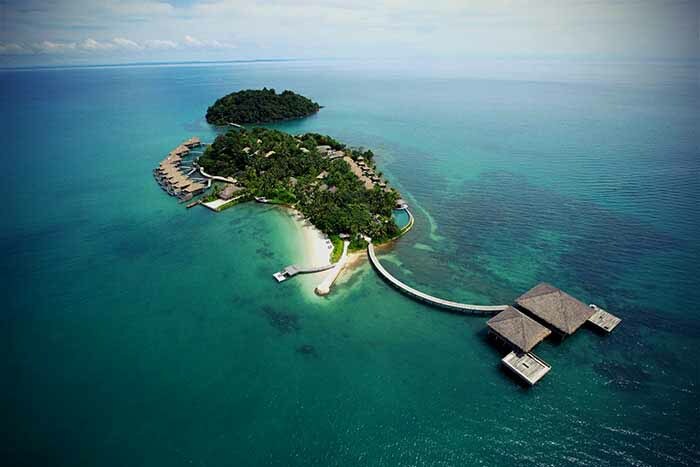 The resort is located on two small, private connecting islands in the middle of a marine reserve of the clear waters of the Gulf of Thailand. The resort features luxurious Over-Water, Jungle and Ocean-View villas built with sustainable materials with respect for maintaining the natural environment. The Song Saa's two dozen one- and two-bedroom villas perch over the water like in the Maldive1s, with several others located in the palm of the island proper, all with unobstructed sight of the ocean and the vivid sunrise and sunsets. A two-bedroom Royal Villa offers complete privacy a private dock for arrivals and departures. All villas are outfitted with king-sized beds, spacious bathrooms (with twin tubs), as well as indoor and outdoor showers, and a private pools. A restaurant and lounge, spectacularly positioned just off the island's shoreline and surrounded by sea. A short stroll on the boardwalk will leave you perfectly positioned to take in dramatic sunsets, seascapes and starry nights. Activities include an ecology program, spa, yoga, swimming pool, and selection of water sports. Impressive, stunning villas in a bucolic setting. Song Saa is an everything is 'on demand' in the resort, including unlimited in-villa fine dining. Consider if you travel falls within the wet season which may have an impact on your visit when daily rainstorms are a regular feature of the wet season (during the months from May to October). Downpours the sea can get pretty rough, making for an uncomfortable crossing, particularly for families with young children. And once on the island, heavy rainstorms can dampen the spirits and limit the choice of activities available. A luxury tented camp by the renowned designer Bill Bensley is set within the lush mountain jungles of the Cardimom Mountains two hour's drive from the capital city, Phnom Penh. The camp marks the arrival of the first luxury safari accommodation in the country, a trend that began years ago with the famed luxury tented camp the Four Seasons Golden Triangle in neighboring Thailand. Shinta Mani Wild is the first luxury camp experience in Cambodia, combining world-class aesthetics, Khmer hospitality, coupled with a conservation mission. Shinta Mani Wild's ngoal for it's pioneering model of a public and private partnerships is to conserve and protect threatened wildlands and also provide new vocational and sustainable opportunities for locals. 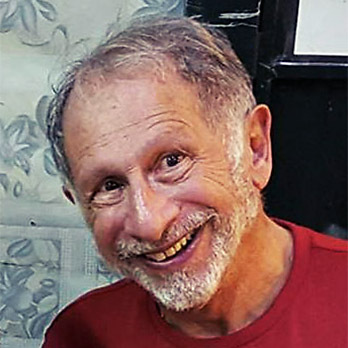 World-renowned resort designer and owner of the resort, Bill Bensley, identified the unprotected wildlife corridor between the Bokor and Kirirom National Parks, and set out to protect this 400-acre river valley from destructive activities of poaching, mining and logging. Partnering with the Wildlife Alliance, The Royal University of Phnom Penh, and the the Cambodian Government, Bensley is bringing this new conservation model to life. Set along a mile of a bouldering river and waterfalls, Bensley set out to create his most ambitious luxury camp project to date. Fifteen 100 square meter, individually-designed tents are perched over the picturesque moving waters, providing a view, calming sounds, and a remote nature retreat experience unlike any other resort in Asia. Each tent has been meticulously designed to invoke the feeling of a true classical safari. Aside from relaxing moments at the camp, guests will be able to spend a day exploring the untrammeled waterways of South East Asia’s last wild estuarine ecosystem aboard one of thre resorts private, Bensley-designed, fully-equipped luxury expedition boats. To the north, guests will be able to accompany rangers and researchers as they check camera traps and study the wild forests and their inhabitants, a unique opportunity to explore these untamed lands with the people that know them best. The camp’s facilities include, perched on the edge of the sanctuary’s biggest waterfall, is the Landing Zone Bar and Waterfall Restaurant, where guests will bhe able to sample locally-inspired food with ingredients sourced through the Shinta Mani Foundation, foraged from the surrounding forests and on occasion flown in from all corners of the globe. The Boulders Spa offers a full service Khmer Spa featuring natural, chemical-free products by Khmer Tonics. A primary objective of Shinta Mani Wild through it's foundation is to provide long-term employment opportunities to the inhabitants of this region, where there is little infrastructure and fewer opportunities to work. Through its properties and hospitality school in Siem Reap, Shinta Mani will provide opportunities for education and training so the camp’s neighbors can become well paid hospitality professionals should they choose to. Shinta Mani will also provide ongoing community outreach and environmental education programs to help its neighbors better understand their environment so they can more successfully coexist with it. A community that is educated about their environment is one that will be sustainably prosperous in that environment. The most exciting addition to Southeast Asia's small luxury tented camp properties in many years, providing travelers with a fresher option in addition to the Four Season's Tented Camp in the Golden Triangle.